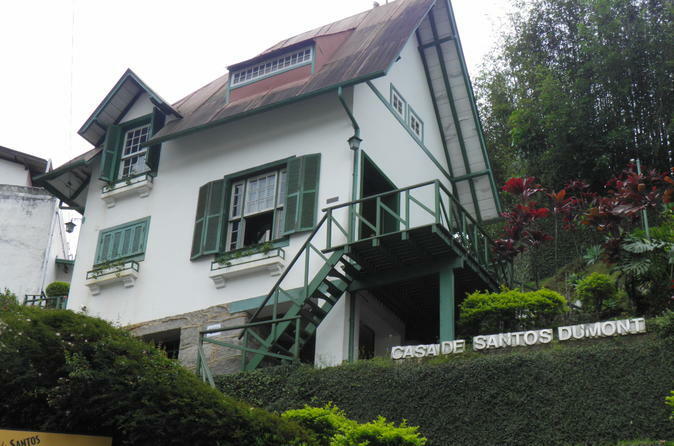 Explore the mountain retreat of Petrópolis on this full-day guided tour. 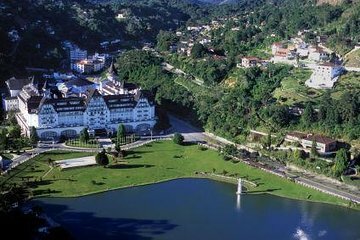 Once a summer holiday destination for the royalty of Brazil, Petrópolis features landmarks like the Crystal Palace, the Imperial Museum and the burial place of Dom Pedro II. Purchase a tour upgrade for a stop at Cervejaria Bohemia, where you'll taste one of Brazil's favorite lagers and learn about the history and science behind this brewery through a tour and interactive exhibits. Round-trip transportation from most Rio hotels is included. Após o embarque matinal no seu hotel no Rio de Janeiro, embarque no seu veículo para o passeio de uma hora e meia até Petrópolis. Passe por cachoeiras e por florestas cênicas no caminho, aprendendo sobre a história da "Cidade Imperial" do seu guia enquanto dirige. Quando você chegar em Petrópolis, enfiado nas montanhas cobertas de florestas da Serra dos Órgãos, comece sua excursão no Museu Imperial. Localizado no antigo palácio de Pedro II, o palácio de estilo austríaco de 1845 dá uma idéia de como a realeza do Brasil viveu. Veja a ostensiva coroa imperial, decorada com mais de 600 diamantes, bem como tapeçarias luxuosas e móveis antigos. Visite a Catedral de São Pedro de Alcântara para admirar sua arquitetura em estilo gótico e prestar homenagem ao local do enterro do último imperador do Brasil. Em seguida, caminhe por um tranquilo parque até o Crystal Palace, um salão de baile de vidro e aço importado da França como presente para a princesa Isabel. Ouça como seu guia descreve as festas pródigas e as exibições reais mantidas lá. Volte para o centro da cidade para comprar o almoço (por conta do visitante). Após o almoço e algum tempo livre para explorar por conta própria, seu veículo voltará para o Rio para o desembarque em seu hotel. Tour Upgrade: Visita à Cervejaria Bohemia Faça um tour pela fábrica para conhecer a cerveja popular do Brasil, que foi produzida pela primeira vez em 1853. Use sua pulseira codificada para aproveitar as exposições interativas da cervejaria e aprender sobre a história da cerveja. Termine o passeio com um sabor de Bohemia acabado de fazer, depois passe algum tempo a experimentar outras cervejas (despesas próprias) ou snacks no bar e restaurante da cervejaria. No final do seu dia explorando Petrópolis, aproveite o desembarque no seu hotel no Rio. Honestly if the tour guide TT hadn't been so funny and entertaining I don't know that I would have enjoyed this tour so much. She and the Imperial Museum are what made it worthwhile. The other sites on the tour were somewhat meh. And the hour spent shopping I could have done without, absolutely nothing of interest on that street. I would have enjoyed more time walking in the historical area by the imperial museum. It looked much more charming than anything on the street for the shopping area. First rate trip to see the highlights of Petropolis. The hotel pickups in Rio at the start of the tour included too man stops. But, once we were on the way our guide, Tanya, was great. She efficiently and effectively communicated to a diverse group in Portuguese, English and Spanish. The tour was well organized once we reached Petropolis. We saw or visited most of the highlights before a late 2:30 pm delightful, bargain-priced lunch next door to the cathedral. It was smart of Tanya to suggest waiting until after lunch to visit the Imperial Museum. By then the crowds had thinned out and we were to tour at a leisurely pace. Tanya was exceedingly accommodating in having the driver drop me off close to the port so as to reboard my ship. The tour was well worth the price, and the guide was worth her weight in gold. enjoyed the trip, very outgoing tour leader. Packed day, quite long. Petropolis is a fascinating place if you are interested in history. The guide was very knowledgeable about the different places we visited and could answer our questions. It is also a very picturesque place and we had plenty of opportunities for photographs, except in the Imperial Museum where it is not allowed. My only issue were there were times when things could be more organized. We were left in downtown for shopping for over one hour, and everyone felt that was a waste of time. The mini bus transport was clean and comfortable, our tour guide TTUHLALA was brilliant, she kept us entertained and informed even though we were the only British couple on the tour. The Petropolis trip started at a chocolate store, which was okay then on to the shopping centre in Petropolis which was not for us. From there we visited the Crystal Palace, quite interesting. We made a short trip to Santo Dumont's house 8 reals entrance fee where a video explained the inventors life. We then had a buffet meal 40 reals good food and value. Next was a visited to the Cathedral followed by the museum Royal Summer Palace, for us this was the highlight of the tour and our guide kept us informed throughout. A worth while day trip made more enjoyable by our guide TT.